The perfect accessory for all of your media devices, this stylus pen exudes style, sophistication and functionality! This twist-action ballpoint pen features a colored barrel with silver accents and clip. Plus, it has a stylus tip on the opposite end for use on touch screens (i.e. smartphones, iPads, tablets, E-readers, etc). 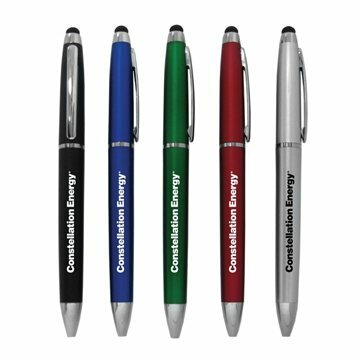 A great executive gift, this pen writes in black ink and can be imprinted with your company name, logo or custom text. The merchandise was very nice symbolized properly. Rosa was very professional and patient when I wanted to make several changes. the artwork was perfect for our logo. The members send their thanks to Rosa for all her help with our order. Fantastic product and amazing customer support. Great promotional product at a great price.